The girl currently known as Megan Jones has been through half a dozen identities in under a year, as have her parents and little sister. Constantly uprooted, forced to live in obscurity, never daring to draw attention to themselves, they’re a family in hiding, a family on the run from killers and criminals. They’re in Witness Protection, and Meg is sure she’ll never get her life back. So sure, by this point, that she’s vowed to stop trying to make a new life. Why bother with friends, relationships, putting down roots, when chances are good she’ll just leave it all behind again in a matter of weeks? She’s taken to carrying her “go bag” with her at all times, a duffel containing the essentials for staying sane from identity to identity, just in case the move comes as suddenly as it did previously. All she wants is to know why her family is constantly being dragged from town to town, forced to adopt new names and backgrounds. She knows her father must have done something, but he’s not talking. The constant change has taken its toll on her family as well: her mother’s drinking is out of control, and her little sister has withdrawn from the world. When Meg and her family are reassigned to the small town of Natchitoches, Louisiana, she figures she’ll lay low and do her best to stay aloof from the locals, kill time until the next move. She has her Rules. No clubs. No friends. No teams. She’ll discover the truth no matter what. Instead, despite her best intentions, she finds reasons to get involved. She picks up a part-time job at a local pizza parlor. She makes enemies of the local mean girls. She develops a love/hate friendship with the handsome, infuriatingly charming Ethan. And slowly, bit by bit, the mystery behind her family’s predicament reveals itself. It wasn’t something her father did. It was something Meg herself witnessed and blocked out of her conscious memory. It’s all her fault. What’s worse, it seems as though the mere act of her digging for answers may have stirred up the wrong sort of interest, and put the bad guys on her trail once more. With Ethan as her only true friend and confidant, and the mysterious Agent Thomas from Witness Protection to occasionally point her in the right direction, Meg uncovers the full truth. The night when someone died. The things she saw. The things only she knows. If she can get home to Phoenix, maybe she can fix everything before it’s too late. But with authorities and bad guys alike looking for her, it’s going to be one heck of an adventure. Right from the start, I was drawn into Meg’s story. The full truth of what’s happened, and just how much she’s already gone through, is revealed slowly throughout the course of the book; it’s not until late in the story when we grasp the full extent of the situation, when we actually learn her real name, and it makes for an interesting parallel to her slowly returning memory. We see her and her family dropped into yet another unfamiliar situation and forced to memorize new names and backgrounds, and at first, it looks as though she’ll keep her head down and muddle through. However, that quickly changes as she breaks several of her own self-imposed rules almost by accident. Or rather, Ethan’s constant and intrusive presence in her new life convinces her to maybe, just maybe, take a chance, even though she knows it to be a bad idea. It’s almost funny to watch her deal with the mean girls/cheerleaders, knowing that she’s already dealt with far worse, and that since she considers this to be a temporary assignment, she has little reason to play nice or care who likes or dislikes her. The Rules for Disappearing is an entertaining, well-layered story. In Meg, Elston’s created a sympathetic and resourceful character who just wants to understand why her life is in a constant state of upheaval. She offers an accurate, if painful, vision of what such change might do to people unused to the rapid and unsettling change in circumstances, from the mother’s alcoholism to the sister’s own mental issues. And when the story changes from something of a high school drama with elements of intrigue to a romantic-edged road trip, to a full-blown thriller, she makes the transitions fairly seamless. Is it a perfect story? No. There are some fairly hard-to-swallow moments regarding Meg and Ethan’s quest for the truth and ultimate journey across country. And one character definitely seems too good to be true, too competent and versatile, like a shadowy deus ex machina. (It’s honestly as though we’re reading the flip side of a spy novel, where some guy comes in, does his mysterious Bondian spy stuff and gets out, and we’re seeing everything from the viewpoint of the baffled bystanders.) The very ending drops hints that we’re not done with this otherwise done-in-one story, and I’m not sure how I feel. I do like Elston’s style and want to see more, but Meg’s story is brought to a satisfying stop point here. (Research indicates that this was a two book deal, so I guess we’ll get some answers in the sequel.) I guess time will tell. 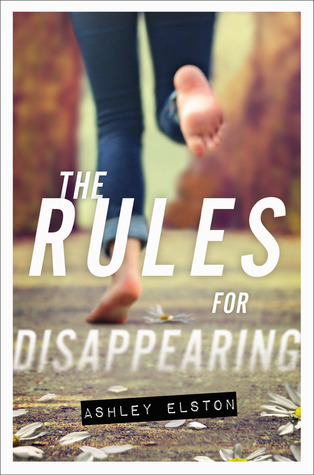 As it stands, The Rules for Disappearing is a strong debut for Ashley Elston, and I look forward to her future offerings.